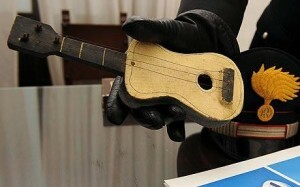 A wee wooden guitar made by Pablo Picasso has been recovered 3 years after it was stolen by a con-man. Picasso made it for his daughter Paloma, but once it was finished he gave it instead to his friend, Italian artist Giuseppe Vittorio Parisi. Parisi kept it for decades, but when he was 92 (in 2007), an unnamed “businessman” persuaded him to part with it. The fraudster promised he’d create a special special wood and glass display case for the piece, but once he had it, he disappeared never to be seen again. When Parisi died in January 2009, his widow Wanda asked the police to retrieve the guitar. The Carabinieri searched for almost a year, finally finding the piece in a shoebox in the closet of a luxury apartment in Pomezia, a town south of Rome. The businessman has been charged with fraud and is currently out on bail. A Picasso expert has authenticated the guitar, thanks in part to an inscription of “Paloma” in the artist’s own hand. Now the little guitar is on its way to Maccagno, a small town on Lake Maggiore where Parisi was born and where his vast collection of art is on display in at the Civic Museum of Contemporary Art.